In a Pinterest world, and a world swimming in social media, I am standing by simple hospitality. I still say simple is best. I love having people over to my home, but when they are over, my intent is not to show off the latest Pinterest decor or over the top recipe, it is to make them feel welcome, comfortable, and at home. Ultimately, it should be to show the the love of Christ in my home. 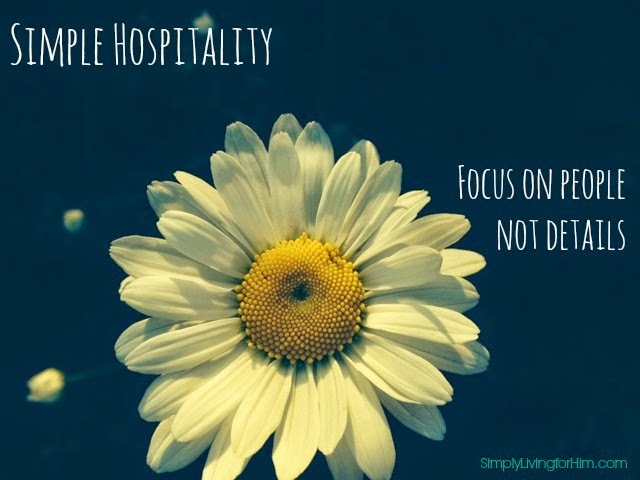 I am not entertaining, but practicing hospitality. Are homes a showcase of accumulations? Or a haven of relationships? I say, come on over… Have a sip of old fashioned lemonade. A warm cup of coffee. And let the focus be on the company, not the surroundings. I would rather have someone come over, see the dust bunnies in the corner, the mismatched furniture, the worn tables, and the scuffs on the floor…but feel the warmth of a welcoming smile and listening ear. I would rather make someone feel comfortable because things aren’t perfect, than on guard because everything feels too perfect. Most of all, I’d rather someone walk out of my house feeling they saw the love of Christ, not a picture perfect home. I’d rather them remember how they felt, than what they saw. So today I am going against the grain. Less is more. Always.